This is a guest post by FamZoo dad, Matt Fisher. Matt describes how he has customized the account, allowance, and chore settings in his virtual family bank to meet his family’s needs and match their values. If your household is anything like mine, various attempts at getting your kids to participate in household chores through allowances have been futile. For starters, I rarely have cash on hand and when I do, it’s usually 20’s spit out by the ATM, which forces me to keep mental track of change owed. I also have trouble providing consistent “dollar values” to chores and tracking their completion, and to further complicate it, I don’t want the kids to spend all their money on Slurpees and Xbox games. (Well, okay, spending it on CoD titles is actually ok with me!) 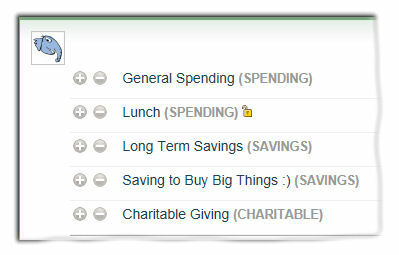 I’d really like them to get a sense of working towards a goal and learning some financial responsibility. I’m an avid technologist (I’m one of those guys who was on the Internet before the WWW existed) so like so many other aspects of complicated modern life, I figured software could help. 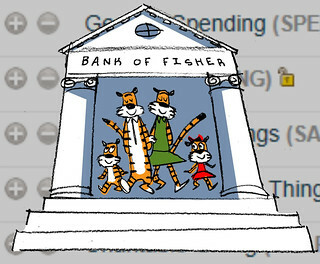 With a little Googling, I found a web application call FamZoo.com and decided to give it a whirl. Here are my thoughts on FamZoo and how I’ve set it for my family but don’t interpret this as a formal review — I make no attempt to be complete, objective, or compare to other software. FamZoo, which I subconsciously refer to as Family Zoo (although their url is actually famzoo.com) is a web application that allows families to create allowance and savings plans that are as complicated or simple as they’d like. It allows kids to track what they’re owed in allowance, for all the times parents never actually have cash on hand. Very importantly too though, it allows you to create a checklist of chores with associated payments and deductions, so the kids can get credited for doing their chore and debited if they don’t. Additionally, it allows me to create multiple target accounts of money for them, such as free cash, savings, charitable donations, etc and split their allowance into those accounts to enforce savings. This allows me to enforce traditional methods such as “3 Jars” and the “50/30/20” rules that are suggested all over the Internet. You can also define multiple income streams for the kids, which I took advantage of to set up a fixed weekly lunch allowance that goes straight into their lunch account. When setting up incomes, you have your choice of methods to use, and it provides a few calculators for common methods. For example, enter your kids’ birth dates, and FamZoo will automatically do the “buck a week per year of age” approach for you. So in net, you can define multiple inputs, and multiple outputs, each with separate rules — this is great flexibility that I took advantage of. the ability to let the kids credit/debit/transfer between accounts. A note of caution: letting the kids control their own credits and debits opens Pandora’s box! A transaction audit log is provided, but in just 2 minutes my awesomely fast clicking son generated enough confusing unearned transactions that I had to go back and delete them. I’ve included more detail about this issue at the end of the post. It quickly became apparent that the two most core concepts were: how to structure the accounts, and how to structure the corresponding chore checklists. For purposes of simplicity, and avoiding World War III, I’m keeping both structures identical for both kids. enforce strong savings concepts, and social responsibility. I’m very proud of our household culture of giving (DD’s 11 year birthday gift request was donations to her favorite non-profit), and I like that FamZoo defaults this Charitable Giving category in. All of the categories are editable, by the way. In fact, pretty much everything you see in the application can be changed and customized. Their lunch “income” is routed directly into their lunch account. As a description for this account, I added a note that they can keep any lunch money if they make and pack their own lunch, but not if they skip lunch at school. This was a little motivator I decided to use, as opposed to making it a “chore”. Kids don’t like chores. This is basically a kid friendly modification of the 50/30/20 rules popular with some adults. I feel like this is good structuring. The kids are pushed into saving a healthy amount of their money, but the majority of it is still in a general account that they can spend at will (much more generously than they’ll experience as adults!) I really like the ability to enforce these splits. While teaching the concept of money and earning is important, I think it’s really important to our economy to reinforce the concept of saving cash. The chore management is just as important to me, though. We’ve never had a strongly regulated household for a variety of reasons, including less disciplined parenting than we would have liked as well as other really legitimate reasons. Therefore, I didn’t want to take too heavy a hand on chores. Nobody likes chores, and the more intelligent the kid, the more challenging it is to motivate them with menial work. I do want to leverage the “automatically make or lose money” capability of FamZoo, but not for everything. Plus, using the automatic credit/debit feature means interacting with FamZoo every time a chore is done, or risk automatically losing that pay. With this in mind, I decided I do want a few things to be punched off every day, but that the majority of chores and behavior modifications should be treated more as opportunity, not requirement. So, I built a system of fixed allowance each week using the age method. This is a common suggestion on how much allowance to give, and the site will automatically calculate it for you based on your kid’s age. Chores are scheduled on a regular basis, and include a credit and a debit. I don’t structure the credits and debits the same though. When the chore is completed and they log in and tick the box, that amount flows into their accounts according to the weekly allowance split. In other words, chore credits are automatically divided between general spending, long term savings, short term savings, and charity. A chore debit, however, is automatically incurred the day after an uncompleted chore is assigned, and comes directly from the child’s general spending account. In other words, the kids automatically lose money for not doing chores, and they lose directly from where it hurts — their spending. You could debit multiple accounts via splits as well, but I predict that the kids will view the enforced savings negatively, so deducting from there doesn’t really have much impact in terms of behavior modification. FamZoo does a great job of letting you decide which account, or which split method (you can define multiple split methods if you’d like) to choose when building a credit or a debit. A Regular Bonus which is a small amount of money that’s split. A Super Bonus is a larger dollar amount that goes directly into their spending account. An Ultra Bonus is geared at the toughest behavior modification, is high dollar, and goes directly into spending. Yes, I’m trying to make this look and feel like a video game. Some of these dollar amounts may look unreasonably high, but remember, I’m trying to create some serious behavior modification here, and I do enforce savings. Part of all this plan is that the kids are going to start paying for things I’ve traditionally paid for out of pocket, such as their cell phones, ongoing video game charges, riding lessons, electronics etc. With that considered I don’t think it’s unreasonable. Easy peasy, and that was the goal. Reported a defect: First of all, there’s a defect in changing chores from repeating chores to non-repeating. Basically it won’t work, and you’ll have to delete the repeating chores and key it back in. I already notified the FamZoo development group, and like a true software startup, one of the developers responded within an hour, on a Sunday night of a holiday weekend. Ah, startups, how I love to miss thee. Today I logged in as an adult and deleted the automatic debits that occurred, since I wanted to give the kids a warm in period . 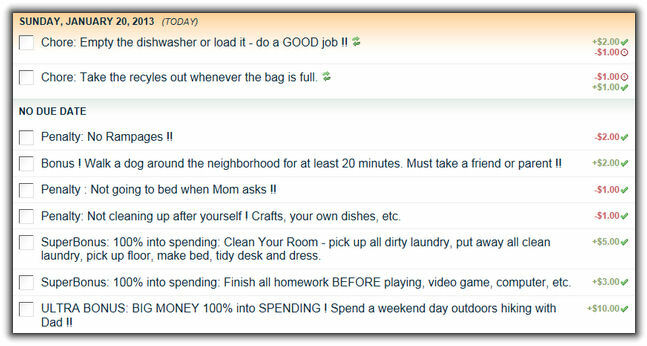 By reminding them gently through the course of the day that they did have some chores to do, and that there were some big bonuses available, I got them to pick up laundry, take out trash and recycles, do dishes, and even spend a couple hours cleaning the house with me. DS even emptied all the trash cans and took the trash to the curb, willingly, cheerfully, quickly, for possibly the first time ever. His best friend was over all day for a lan party, which definitely had him in better moods though, so I can’t tell how much was the incentive plan, and how much was having his friend over. As mentioned earlier on, I discovered another aspect of the software, which prompted me to change some settings. You can give the kids the ability to credit, debit and transfer funds between accounts themselves. This actually works as designed; if you check that box from within an account setting they can indeed add and remove funds, and transfer funds. The glitch is that they can literally add $500 to an account if they wish. You have the option of creating email or text based alerts (which I did to confirm operation), but this essentially gives them a complete backdoor to gaming it. Less clever kids will do something like add 500 dollars — easily detected through basic auditing or notifications. Clever kids like mine however, will quickly learn that adding a few bucks here or there, justifying it with a “oh remember I did this but forgot to log in and check it off” will quickly spam the human auditor (Mom or Dad) and a-skimming they will go. I think a good future design, however, would be to separate transfer permission from the credit/debit permission with the requirement that the parent be able to designate to-and-from relationships — this would also have to be many-to-many, so that I could allow transfers from savings or general spending into long-term savings. I think it would also be a creative design to allow credits and debits to be request based. Rather than notifying that the action occurred: FamZoo would send an email or create a message queue in the interface notifying the parent that the child requested to credit or debit. The parent could permit the action from the message queue in the UI or by responding to email/text alerts. I don’t like the idea of my kids getting to gunk up the transaction log. Please note this is a very real risk. My son, within about 45 settings of logging in, had rapidly created a complex set of transactions that I actually had difficulty reviewing and reversing. But then, you know my boy, he’s an intelligent and evil as his old man... That is, of course, all hear-say! The kids also can’t “print a check out” like other apps (that let them print a check to be cashed by Mum or Dad, and automatically debit the system). I’m fine with that too — again, I’m really trying to encourage focus on the earning and the behavior modification. Another glitch I found is that chores without an associated due date (which are the majority of mine) do appropriately appear as having no due date, but they disappear when punched off and can’t be reused. In other words, they’re still temporal, despite not being assigned to a specific day. DD had punched a bonus yesterday that she wasn’t able to punch today because it was gone. The solution to that was to change all the bonuses from “No Due Date” to a daily recurring, so that they showed up every day. Since these are bonuses, with no penalties for missing them, the fact that they expire every day have no bearing. 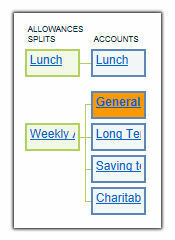 I would love to see some more behavioral modification features like bonuses and “constants” included in FamZoo. It’s already very feature rich, and I think it’s prime for extension into other clever areas. This is, in fact, a piece of software I would love to work on myself. It’s fun. It’s well designed and executed to date, but I can already identify meaningful ways for it to grow. This was a guest post by FamZoo dad, Matt Fisher. Thanks for swinging by and posting the news about your book opportunity.